George Lucas was a landscape and figure painter in oils who exhibited between 1871-1899. 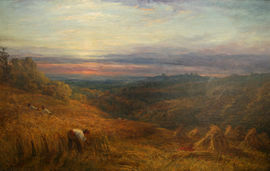 He painted in Victorian poetic landscape tradition scenes of landscapes of Surrey. He exhibited at Birmingham 3, Glasgow 1, Glasgow Institute 8, Liverpool 6, Manchester 10, Royal Academy 17, Royal Society British Artists 7, Royal Institute 7.